Whether you are working on a project around the home or you are a carpenter by trade, the name of the game in woodwork is efficiency. Having the right tools and equipment go a long way in this regard. It goes without saying that the backbone of a woodwork project is a really great saw. A high-quality saw can increase efficiency through faster cutting, thereby reducing the amount of time you spend trying to complete a project by nearly half. One such saw is the Makita cordless circular saw. The Makita 18V LXT Lithium-Ion Brushless Cordless 6-1/2 saw (XSH03Z) shows exactly why Makita is a leader in brushless motor technology innovation. Built for faster ripping and cutting, this model combines runtime and power in a sleek cordless design, fully equipped with the Makita BL (TM) brushless technology and Automatic Speed Change (TM) technology – Both engineered for optimum performance. Speed and torque are adjusted during operation, thanks to the Speed Change technology, while the Brushless Motor is engineered to increase the saw’s runtime, speed, and power. 1. Is the battery life any good? Of course, with a cordless saw, your first and immediate concern is likely to be the battery life offered. Those using the Makita cordless saw will find that it is highly energy efficient. The Brushless Motor technology optimizes the battery’s energy use by up to 50% per charge, thanks to its electronically controlled system. Additionally, the Makita cordless circular saw is fitted with Star Protection Computer Controls (TM) (also created by Makita) which allows for extended battery time by monitoring conditions and exchanging data in real-time to prevent against overheating, overloading and over-discharging. 2. How powerful is it? Sometimes cordless circular saws can lack the sort of power needed or we have come to expect when compared with their non-cordless counterparts. Thankfully, this is not the case with the Makita Brushless Cordless 6-1/2 saw. At 18V, this cordless circular saw packs a punch thanks to the specially engineered Makita technology it is infused with – namely, the Brushless Motor technology in particular and the features that allow for battery power optimization and longevity. 3. Are the batteries and charger included with a Makita cordless saw purchase? No. 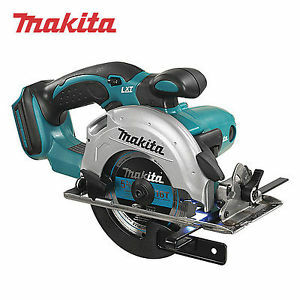 Batteries and charger are not included when you purchase a Makita cordless circular saw. They are sold separately. Importantly, only genuine Makita batteries and chargers should be used with this tool. Compact, lightweight, and ergonomic in design, this Makita cordless saw is built to last. For starters, there is XPT (TM) Extreme Protection Technology that offers improved water and dust resistance for those times it is being used in harsh conditions – helping it to last longer. As far as power and speed are concerned, the Makita 18V cordless 6-1/2 saw’s secret lies in the BL Motor technology. By delivering 5000 RPM and eliminating carbon brushes, the BL Brushless Motor enables faster cutting and ripping while allowing the motor to run more efficiently at cooler temperatures for a long time to come. 5. What’s the warranty like? The Makita cordless circular saw comes with a three-year warranty. The state of the art technology and engineering employed in designing the Makita cordless circular saw makes it an efficient, powerful, and durable must-have for any tool shed.